What happens when you're CEFEX certified? 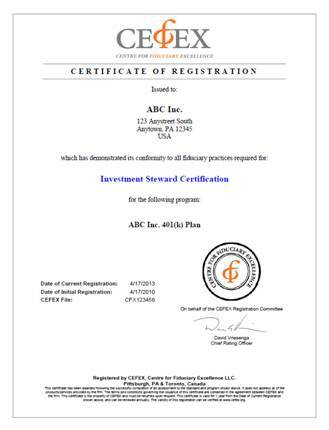 You will receive a certificate confirming compliance with the Standard, which you can display in your workplace. You will be able to use the CEFEX Mark on all your communications such as websites, annual statements, letterhead, etc. The CEFEX Mark can also be useful in your recruitment advertising. 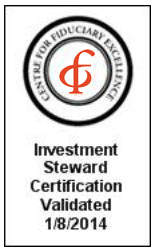 The CEFEX Mark is available as an HTML image which is validated daily and when clicked, displays your certificate. A News Release is distributed to our fiduciary community and can be helpful in promoting your organization to your local media outlets. The name of your organization will appear on the CEFEX website. The optional CEFEX Profile can be helpful in promoting and describing your certification. As a case study, it may get additional exposure if distributed throughout the fiduciary community and at our conferences.